The Red Grouper is predominantly found in the eastern parts of the Gulf of Mexico, making them a popular fish in our area. They feed on smaller fish, squid, shrimp, crabs, and other crustaceans. Red Grouper fishing is a favorite among local and visiting anglers due to their excellent food quality and the fight they put up thanks to their ambush style of hunting. Description: Red Grouper are a rusty, reddish-brown fish with lighter, sometimes white, colored markings on their sides. Most recognizable is the elongated second dorsal fin and the lack of membrane between the second and third spine. They also have a sharply square tail and a black pattern around the eyes. Common in most grouper, the Red Grouper is a protogynous hermaphrodite. 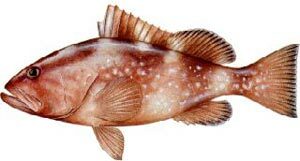 Born as females, grouper change into males for breeding purposes as they age and grow. Most large grouper are male. Size: While most catches are less than 20 lbs., there have been reports of Red Grouper exceeding 50 lbs. Location: When going Red Grouper fishing, it is important to keep in mind that these fish prefer “live bottoms” such as reef systems in waters deeper than 30ft. Older fish, often over 6 years old, live offshore while younger, mostly female grouper, prefer to stay nearshore. 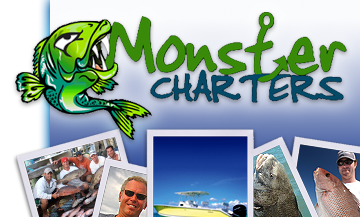 Contact Monster Charters today for more information on Red Grouper fishing, our available charters, and how we can help you plan the fishing trip of a lifetime in the Tampa, St. Petersburg, and Clearwater areas!